"If I wanted to, I would show you that in all walks of life there h ave been great servants of the Blessed Virgin. I would find for you, among t hem, those who begged their bread from door to door. I would find for you, among them, those who lived in much the same sort of state in life as many of you. I would find them for you among the wealthy, and in great number, too. We read in the Gospel that our Lord always treated people with great tenderness, except for one type of people whom He treated with severity; these were the Pharisees, and they were so treated because they were proud and hardened in sin. They would willingly have hindered, if they could, the accomplishment of the will of the Father. What is more, our Lord called them 'whited sepulchers, hypocrites, brood of vipers, offspring of vipers, who devour the breasts of their mothers." We can say the same thing on the subject of devotion to the Blessed Virgin. All Christians have a great devotion to Mary except those old and hardened sinners who, for a very long time, having lost the faith, wallow in the slime of t heir brute passions. The Devil tries to keep them in this state of blindness until that moment when death opens their eyes. Ah! If they had but the happiness to have recourse to Mary they would not fall into Hell, as will happen to t hem! No, my dear children, let us not imitate such people! On the contrary, let us follow the footsteps of all those true servants of Mary. Belonging to this number were St. Charles Borromeo, w ho always said his rosary on his knees. What is more, he fasted on all vigils of the feasts of the Blessed Virgin. He was so careful about saluting her on the stroke of the bell that when the Angelus rang, wherever he was, he went down on his knees, sometimes even in the middle of the road when it was full of mud. He desired that his whole diocese should have a great devotion to Mary and that her name would be uttered everywhere with the utmost respect. He had a number of chapels built in her honor. Now the, my dear brethren, why should not we imitate these great saints who obtained so many graces from Mary to preserve them from sin? Have we not the same enemies to fight the same Heaven to hope for? Yes, Mary always has her eyes upon us Do we suffer temptations? Let us turn our hearts towears Mary and we shall be delivered." 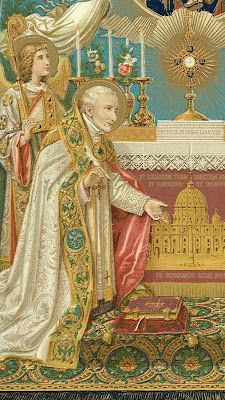 St. Peter Julian Eymard - The Most Blessed Sacrament is not Loved! "THE MOST BLESSED SACRAMENT IS NOT LOVED! Tota die expandi manus Meas ad populum non credentem, et contradicentem. ALAS! It is but too true: our Lord in the Most Blessed Sacrament is not loved! He is not loved by the millions of pagans, by the millions of Jews and infidels, by the millions of schismatics and heretics who either know nothing of the Eucharist or have wrong notions of it. Among so many thousands of creatures in whom God has placed a heart capable of loving, how many would love the Blessed Sacrament if they knew it as I do! Must I not at least try to love it for them, in their stead? Even among Catholics, few, very few love Jesus in the Most Blessed Sacrament. How many think of Him frequently, speak of Him, come to adore Him and receive Him? What is the reason for this forgetfulness and coldness? Ah! They have never tasted the Eucharist, its sweetness, the delights of its love! They have never known the goodness of Jesus! They have no idea of the extent of His love in the Most Blessed Sacrament! Some of them have faith in Jesus Christ but a faith so lifeless and superficial that it does not reach the heart, that it contents itself with what is strictly required by conscience for their salvation. And besides, these last are but a handful among so many other Catholics who live like real pagans, as if they had never heard of the Eucharist". I would ask that you remember one prisoner in particular in your prayers. Father Gordon MacRae and also his friends incarcerated with him. 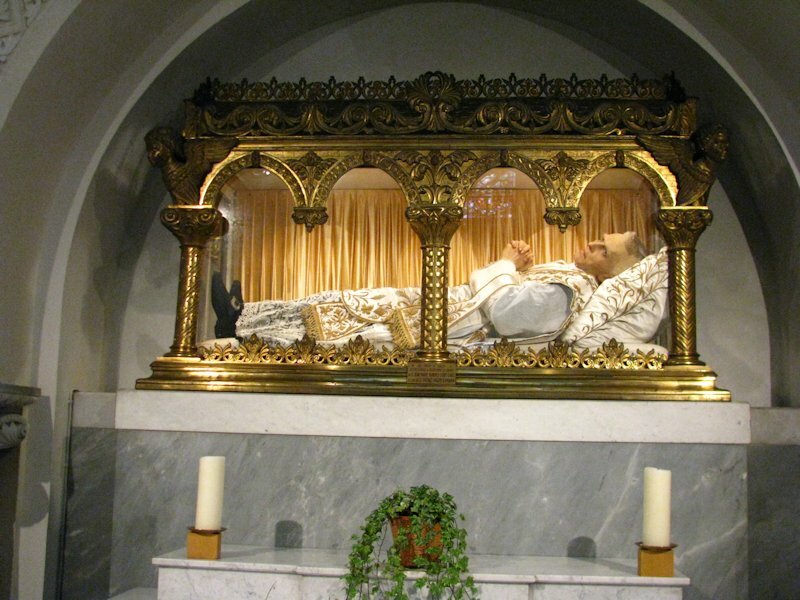 Yesterday was the feast of a saint whose spiritual guidance is priceless. Today is the feast another saint whose spiritual guidance will also help make one a saint if we would only listen. "We should only make use of life to grow in the love of God." "The upright intention is the soul of our actions. It gives them life and makes them good." "It is folly not to think of death. It is greater folly to think of it, and not prepare for it." "The most perfect and meritorious intention is that by which, in all our actions, we have in view only the good pleasure of God and the accomplishment of His holy will." "Act as if every day were the last of your life, and each action the last you perform." "Woe to him who neglects to recommend himself to Mary, and thus closes the channel of grace!" "God refuses no one the gift of prayer. By it we obtain the help that we need to overcome disorderly desires and temptations of all kinds." "There are many things which seem to us misfortunes and which we call such; but if we understood the designs of God we would call them graces." "When one does not love prayer, it is morally impossible for him to resist his passions." "When the devil again tempts you to sin, telling you that God is merciful, remember that the Lord showeth mercy to them that fear Him, but not to them who despise Him." "He who suffers in patience, suffers less and saves his soul. He who suffers impatiently, suffers more and loses his soul." "Let us thank God for having called us to His holy faith. It is a great gift, and the number of those who thank God for it is small." "When the afflictions of this life overcome us, let us encourage ourselves to bear them patiently by the hope of heaven." "To put into practice the teachings of our holy faith, it is not enough to convince ourselves that they are true; we must love them. Love united to faith makes us practise our religion. "God pardons sins; but He will not pardon the will to sin." "He who does not overcome his predominant passion is in great danger of being lost. He who does overcome it will easily conquer all the rest." "A soul which does not practise the exercise of prayer is very like a paralyzed body which, though possessing feet and hands, makes no use of them." "When you do a good action, have the intention of first pleasing God, and then of giving good example to your neighbor." "To acquire courage it is very useful to read the lives of the saints, especially of those who, after living in sin, attained great sanctity." "The truly humble reject all praise for themselves, and refer it all to God." "We do not keep an account of the graces which God has given us, but God our Lord keeps an account of them. He has fixed the measure thereof." "Mary was the most perfect among the saints only because she was always perfectly united to the will of God." "After the love which we owe Jesus Christ, we must give the chief place in our heart to the love of His Mother Mary." "When we feel our cross weighing upon us, let us have recourse to Mary, whom the Church calls the 'Consoler of the Afflicted.'" 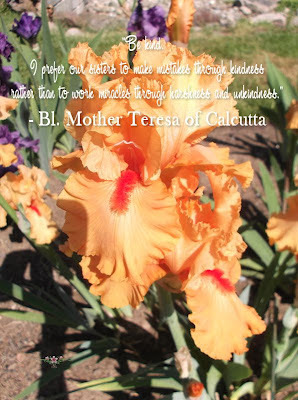 "Blessed are the actions enclosed between two Hail Marys." 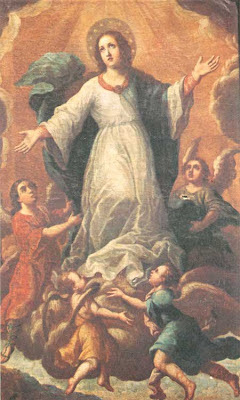 "The servants of Mary who are in purgatory receive visits and consolations from her." "He who remembers having invoked the name of Mary in an impure temptation, may be sure that he did not yield to it." "Mary being destined to negotiate peace between God and man, it was not proper that she should be an accomplice in the disobedience of Adam." "Mary having co-operated in our redemption with so much glory to God and so much love for us, Our Lord ordained that no one shall obtain salvation except through her intercession." "He who wishes to find Jesus will do so only by having recourse to Mary." "Mary having always lived wholly detached from earthly things and united with God, death, which united her more closely to Him, was extremely sweet and agreeable to her." "Mary being in heaven nearer to God and more united to Him, knows our miseries better, compassionates them more, and can more efficaciously assist us." "The Virgin Mother, all pure and all white, will make her servants pure and white." "Let us offer ourselves without delay and without reserve to Mary, and beg her to offer us herself to God." "Such is the compassion, such the love which Mary bears us, that she is never tired of praying for us." "May the two names so sweet and so powerful, of Jesus and Mary, be always in our heats and on our lips!" "Whatsoever we do, we can never be true children of Mary, unless we are humble." "Let us highly esteem devotion to the Blessed Virgin, and let us lose no opportunity of inspiring others with it." "As a mother feels no disgust in dressing the sores of her child, so Mary, the heavenly infirmarian, never refuses to care for sinners who have recourse to her"
"When the devil wishes to make himself master of a soul, he seeks to make it give up devotion to Mary." "Know that of all devotions the most pleasing to Mary is to have frequent recourse to her, asking for favors." "Let the servants of Mary perform every day, and especially on Saturday, some work of charity for her sake." "Can we, amongst all hearts, find one more amiable than that of Jesus? It is on His Heart that God looks with special complacency." "One must wage war against his predominate passion, and not retreat, until, with God's help, he has been victorious." "An act of perfect conformity to the will of God unites us more to Him than a hundred other acts of virtue." "He can not err who is constantly with the visible Head which Jesus Christ has left to His Church, as its foundation, rule, teacher, and defender of the Faith." "Wo to us poor sinners if we had not the Divine Sacrifice to appease the Lord?" "Our Faith will never be true unless it is united to that of St. Peter and the Pontiff, his successors." "The brightest ornaments in the crown of the blessed in heaven are the sufferings which they have borne patiently on earth." "The reason why the lukewarm run so great a risk of being lost is because tepidity conceals from the soul the immense evil which it causes." "The sufferings endured for God are the greatest proof of our love for Him." "I have to seek only the glory of God, my own sanctification, and the salvation of my neighbor. I should therefore devote myself to these things, if necessary, at the peril of my life." "To give up prayer because we are often distracted at it is to allow the devil to gain his cause." "Let us remember that every act of mortification is a work for heaven. This thought will make all suffering and weariness sweet." "If you can not mortify your body by actual penance, abstain at least from some lawful pleasure." "Without prayer we have neither light nor strength to advance in the way which leads to God." "An upright intention is the soul of our actions. It gives them life, and makes them good." "The saints owed to their confidence in God that unalterable tranquility of soul, which procured their perpetual joy and peace, even in the midst of adversities." saints sanctified themselves by prayer. "Always give the preference to actions which appear to you the most agreeable to God, and most contrary to self-love." "We should constantly thank the Lord for having granted us the gift of the true faith, by associating us with the children of the holy Catholic Church." Some are unable to fast or give alms; there are none who can not pray." "We should bear our sufferings in expiation for our sins, to merit heaven and to please God." "Let us make up for lost time. Let us give to God the time that remains to us." "There are some who sin through frailty, or through the force of some violent passion. They desire to break these chains of death; if their prayer is constant they will be heard." "'Thy will be done!' This is what the saints had continually on their lips and in their hearts." "If he be blind who refuses to believe in the truths of the Catholic faith, how much blinder is he who believes, and yet lives as if he did not believe!" "If you would keep yourself pure, shun dangerous occasions. Do not trust your own strength. In this matter we can not take too much precaution." "Prayer is our principal weapon. By it we obtain of God the victory over our evil inclinations, and over all temptations of hell." "As all our wickedness consists in turning away from our Creator, so all our goodness consists in uniting ourselves with Him." "He who wishes to find Jesus should seek Him, not in the delights and pleasures of the world, but in mortification of the senses." "We may have a confident hope of our salvation when we apply ourselves to relieve the souls in purgatory, so afflicted and so dear to God." "Let us red the lives of the saints; let us consider the penances which they performed, and blush to be so effeminate and so fearful of mortifying our flesh." "The greatest pain which the holy souls suffer in purgatory proceeds from their desire to possess God. This suffering especially afflicts those who in life had but a feeble desire of heaven." "A resolute will triumphs over everything with the help of God, which is never wanting." "When we have to reply to some one who speaks harshly to us, we must always do it with gentleness. If we are angry, it is better to keep silence." "The two principal dispositions which we should bring to holy communion are detachment from creatures, and the desire to receive Our Lord with a view to loving Him more in the future." "No prayers are so acceptable to God as those which we offer Him after communion." "What is it that renders death terrible? Sin. We must therefore fear sin, not death." "When one has fallen into some fault, what better remedy can there be than to have immediate recourse to the Most Blessed Sacrament? "Let your constant practice be to offer yourself to God, that He may do with you what He pleases." "We can obtain no reward without merit, and no merit without patience." "Do not consider what others do, or how they do it; for there are but few who really work for their own sanctification." "Today God invites you to do good; do it therefore today. Tomorrow you may not have time, or God may no longer call you to do it." "God is our light. The farther the soul strays away from God, the deeper it goes into darkness." "The King of heaven deigned to be born in a stable, because He came to destroy pride, the cause of man's ruin." "To save our souls we must live according to the maxims of the Gospel, and not according to those of the world." "If you wish to be pleasing to God and happy here below, be in all things united to His will." "The past is not longer yours; the future is not yet in your power. You h ave only the present wherein to do good." On a hot July evening in the year 1216 Saint Francis of Assisi at prayer devoured by his love for God and a thirst to save souls was visited upon by Our Blessed Savior and Our Blessed Mother. Our Lord spoke to him "Francis you are very zealous for the good souls. Ask me what you want for their salvation." Francis answered that he wanted an indulgence to all those who enter this church,(The Portiuncula) who are truly contrite and have confessed their sins. Our Lord consented to Francis' wish, but only after he received approval from Pope Honorius III. The pope granted this petition, and this indulgence has been extended to all parish churches throughout the world from noon August 1 until midnight on August 2. * Participation in the Mass and Eucharist. * Recitation of the Apostles' Creed, Our Father and a prayer for the pope's intention. The Portiuncula Indulgence is a grace not to be missed, not only for yourself but for the many souls suffering in purgatory. The dates are from noon on August 1 until midnight on August 2, the feast of Our Lady of the Angels. "There are two guarantees of a wise rule of conduct: the though before action, and self-command afterward." "Place before your eyes as models for imitation, not the weak and cowardly, but the fervent and courageous." "The shortest, yea, the only way to reach sanctity, is to conceive a horror for all that the world loves and values." "Here is the difference between the joys of the world and the cross of Jesus Christ: after having tasted the first, one is disgusted with them; and on the contrary, the more one partakes of the cross, the greater the thirst for it." "A precious crown is reserved in heaven for those who perform all their actions with all the diligence of which they are capable; for it is not sufficient to do our part well; it must be done more than well." "God gives each one of us sufficient grace ever to know His holy will, and to do it fully." "Mary's sorrow was less when she saw her only Son crucified, than it is now at the sight of men offending Him by sin." "That which would have easily been remedied at first, becomes incurable by time and habit." "Among the gifts of grace which the soul receives in holy communion there is one that must be numbered among the highest. 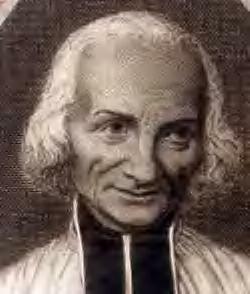 It is, that holy communion does not permit the soul to remain long in sin, nor to obstinately persevere in it." "Discretion is necessary in spiritual life. It is its part to restrain the exercises in the way of perfection, so as to keep us between the two extremes." "God's way in dealing with those whom He intends to admit soonest after this life into the possession of His everlasting glory, is to purify them in this world by the greatest afflictions and trials." "Love ought to consist in deeds more than in words." "Labor to conquer yourself. This victory will assure you a brighter crown in heaven than they gain whose disposition is more amiable." "Do nothing, say nothing before considering if that which you are about to say or do is pleasing to God, profitable to yourself, and edifying to your neighbor." "Take care that the worldling does not pursue with greater zeal and anxiety the perishable goods of this world than you do the eternal." "I will carefully consider how, on the day of judgment, I would wish to have discharged my office or my duty; and the way I would wish to have done it then I shall do now." "He who forgets himself in the service of God may be assured that God will not forget Him." "Our Lady, deign to intercede for us sinners with they divine Son, our Lord, and obtain of Him a blessing for us in our trials and tribulations!" "Be careful and do not lightly condemn the actions of others. We must consider the intention of our neighbor, which is often good and pure, although the act itself seems blameworthy." "Idleness begets a discontented life. It develops self-love, which is the cause of all our misery, and renders us unworthy to receive the favors of divine love." "If the devil tempts me by the though of divine justice, I think of God's mercy; if he tries to fill me with presumption by the thought of His mercy, I think of His justice." "If the love of God is in your heart, you will understand that to suffer for God is a joy to which all earthly pleasures are not be to compared." "How few there are who avail themselves of the precious blood of Jesus to purchase their salvation." "Put not off till to-morrow what you can do today." "Idleness is hell's fishhook for catching souls." "One of the most admirable effects of holy communion is to preserve the soul from sin, and to help those who fall through weakness to rise again. It is much more profitable, then, to approach this divine Sacrament with love, respect, and confidence, than to remain away through an excess of fear and scrupulosity." "You wish to reform the world: reform yourself, otherwise your efforts will be in vain." "Your heart is not so narrow that the world can satisfy it entirely; nothing but God can fill it." "It is an act as rare as it is precious, to transact business with many people, without ever forgetting God or oneself." On the feast of the Conversion of St. Paul, January 25, 1959, Pope John Paul XXIII had announced the convocation of a general council for the universal Church. And the Second Vatican Council was born. John XXIII had been pope for fewer than 100 days. Trembling with emotion, he issued the call for an ecumenical council in the Basilica of St. Paul Outside the Walls in the presence of 17 cardinals of the Curia and other Church servants. 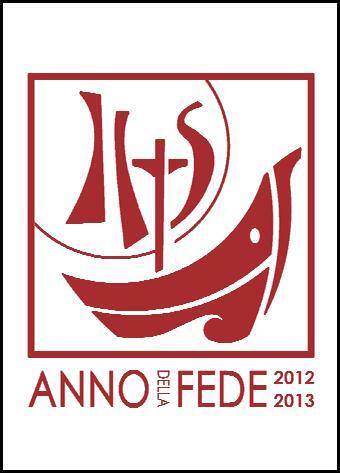 Now in 2012 we observe the 50th anniversary of the opening session of Vatican II. And Vatican II still challenges us. Three years of preparation led to the four sessions of Vatican II, which began in 1962 and concluded in 1965. Blessed John XXIII passed to his eternal reward after the first session, and Pope Paul VI presided over the remaining three sessions. In the nascent Church, the Council of Jerusalem (Gal 2:1-10 and Acts15:1-22), like the Second Vatican Council, dealt with challenging pastoral questions. Paul, Titus, Barnabas, and others came to Jerusalem to meet with Peter, James, and other leaders of the apostolic Church to meld different but complementary charisms and gifts for the good and growth of the Church. The Jerusalem Council is an early example of the very real interrelationship between the human and the divine in Christ’s Church. A similar interplay was experienced at the Second Vatican Council. Benedict XVI prudently teaches us that the false “hermaneutic of discontinuity and rupture” needs to be replaced by an authentic “hermeneutic of continuity and reform.” History shows us that the Church is not always the same, but is reformed and always reforming. Continuity and reform provide the correct directional map for the study and implementation of Vatican II. As we enter the fiftieth anniversary celebration of the Second Vatican Council, let us consider this an invitation and opportunity to refresh and renew ourselves by rereading (or reading for the first time) the dynamic teachings of the Council. These documents reveal a Church ever faithful, a divine gift, a Church ever dynamic, and a grace that continues from that very first council at Jerusalem. Pope Benedict XVI reminds us that “The Church both before and after the Council is the same one, holy, catholic, and apostolic Church journeying through time.” He invites us to ponder this truth with special attention in a Year of Faith, beginning on October 11, 2012, and concluding on November 24, 2013, the feast of Christ the King. The Year of Faith marks the fiftieth anniversary of the opening of Vatican II and the twentieth anniversary of the promulgation of the Catechism of the Catholic Church. 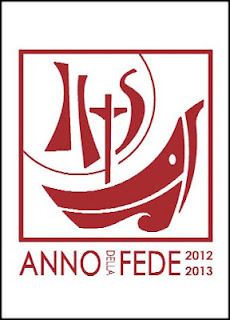 Benedict XVI announced this second Year of Faith in his apostolic letter, Porta Fidei (Door of Faith), dated October 11, 2011. Pope Paul VI proclaimed a Year of Faith in 1967 to mark the nineteenth centenary of the martyrdom of Saints Peter and Paul. How will you observe these anniversaries?